So this post really isn't about the Inauguration. Zambia decided and some of us may not have gotten what we wanted, but today incumbent President, His Excellency Edgar Chagwa Lungu, is being sworn in. What has come out of this election cycle is that Zambia is a flock of lost sheep who are so desperate for direction. For me the political arena really isn't the place to duke this out, as personally I do not see my principles and my ideals for Zambia even remotely represented by anyone who seeks to serve in that capacity. I have no idea what is going on in that ring, so this bull is using her horns to bust out and explore the great wide world out there for answers and to create my own solutions that hopefully have an impact in some way on a larger scale. This past weekend I went on an amazing artistic journey quite by accident. I have been in hibernation pretty much all year, trying to put myself back together after inadvertently finding myself the protagonist in what I realised was a Humpty Dumpty phase. Thankfully all the King's horses and all the King's men were not required, but this Queen needed a whole lot of soul searching to reemerge. I may have ended up broken after last year's success, but I am on the mend and patched up enough to move forward. Part of that has been reconnecting with life in Lusaka and thankfully new hope has revealed itself. I have been inspired by our tenacity, and that artists in particular are finding ways to express themselves, even though this is a fearful time in Zambia - a time in which many of us youth are fearful of things regressing so far - that there will be no path for our future, only a way for the archaic, the disconnected, the greedy and the power-grabbers. On Friday I decided to go to a Modzi Arts event about whether we do indeed have Zambian Literature. One of my girl crushes Mulenga Kapwepwe was on the panel and she talked about how it is clear from the way we write today that we have no idea who we are. We defined only in the past tense, in writers long gone. We take on other people's voices, experiences, their landscapes without having visited and try to co-opt their lives unsuccessfully. We would rather write in broken English, live the life we watch on TV and adopt their truths and their pain, than actually tackle the specifics of our situation. There is nothing wrong with being inspired by others. There is everything wrong with living in someone else's skin with no real understanding of who they are and worse who you are. In order for Zambia to move forward, to create great works, we need to live in our dysfunction, channel that through what we do and manifest, in order to work through and come out the other side wiser, strong and defined. There is nothing wrong with declaring your truth, however untidy it may be. If you are discombobulated, say you are and be done with it. If you need to look back to figure out where you are to move forward, then do so. Take it from someone who has spent their life deranged and confused. I have blogged over and over about how I live in uncertainty - you can still find identity in the unknown...trust me ;)! What made me proud to be Zambian after the performance was the fact that the youth who put together Lenshina, took on a very controversial subject in a time when people are retreating to their corners and are afraid to speak. They were able to comment on today using the past. And they did it in a refreshingly modern way, not limited by the comfort Zambians feel in the familiar. We tend to produce content that is stale, repetitive and tired. Our complacency, which has led to the disquiet and dissatisfaction that has manifested itself in cadre violence, political clamp downs and the loss of our peace and friendliness, has in turn revealed itself in art that proves that imitation is not always the best form of flattery. We may have found comfort in knowing what is coming but it keeps us stagnant. It has stopped us from growing. And knowing that forces wanting to "help" will come and bail us out has put us in a position of begging. And this was reflected in some reactions to the play, asking for more of the story as they felt they enjoyed it so much it should have included everything about the Uprising to make it longer, which completely misses the point. The play took a particular stand. Unbiased yet strongly pointed. 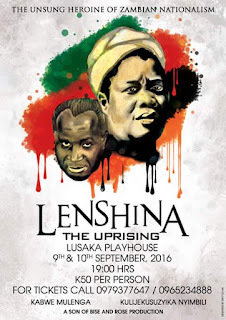 Was Lenshina in the wrong or was Kaunda? The rapier delivery of dialogue built on short sentences and each scene ending with the protagonists accusing each other of having "blood on their hands", perfectly articulated the struggle of defining self and moving forward after colonisation - that One Zambia One Nation was something that needed to be worked at even then. Lives were lost in the struggle and it is up to each of us to come to our own conclusions and most importantly I feel, be inspired by our history not to fall into the same pitfalls our Founding Fathers did. Not to be afraid of different points of view. To allow for nuance. To respect our differences and work harder to find common ground to ensure peace beyond tolerance. I will discuss this much going forward as I launch my new endeavour the ACE Project. The play was timely, evident in the fact that religion played a huge part in the confusion and lies were disseminated on both sides to advance each others causes. Both sides I feel were honourable and authentic in their point of view, but their truths were subjective to their experience and goals which blinded them. That ultimately led to clashes rather than compromise for a better future. To miss those parallels because you weren't given the full story is short-sighted. To not understand that true art fills your soul yet sparks your spirit to want more is an oversight we cannot avoid. If you feel a different presentation was required, create your own chance, write your own play, give us another view. Art is never complete, it is supposed to add to the conversation and facilitate the creation of more. Art is meant to "comfort the uncomfortable and discomfort the comfortable". It is not meant to necessarily answer your questions, but it can give you peace knowing that the questions are out there and that the answers are being searched for, the solutions and being worked on. This play used that past to give us the language today to communicate what we are feeling, to know that this is not anything new, but also to warn us that just because it has happened before, doesn't mean it should happen again. Repeating history is not an excuse, evidence to be justified in defeat. Instead of praying from a place of hopelessness and not hope, let's help ourselves as deliverance comes to those who demand it through their actions. Ultimately the play was able to contribute to the conversations we are having and inspire us to respond in turn. Despite the rickety theatre, the lack of resources, the cast and crew persevered. Their situation is a metaphor for and the reality of Zambia right now. They were able to find and communicate a painful beauty despite the shadows trying to overcast and obscure. They illuminated their desire to succeed in the most thoughtful and entertaining way. They achieved what great art does, they were able to inspire. Hence this blog post ;}!